The video game adaptation of the newly released TMNT movie has finally arrived, but will it live up to the classic TMNT name? Epic tales...Of Mediocrity: The TMNT game has been released obviously as a huge moneymaker that's "based" off the movie. The problem is that TMNT barely has anything to do with the actual movie. If you were expecting the story of TMNT to follow the same plot as the movie, you will be very disappointed. In fact, for some reason the story of TMNT barely has anything to do with the movie's plot, and the TMNT story is told in a disjointed form of flashback narration, with the turtles chiming in at random intervals to "explain" chunks of the story (usually skipping over the parts that would make the game's story actually make sense). Teenage Mutant Surfer Turtles: One of the most annoying aspects of TMNT is the horrible dialogue that is spewed out of the turtles' mouths. The actual voice acting in the game is ok, (none of the voices that did the movie though) but you will be forced to hear stupid one-liners that relate to surfer speak at every turn. It normally wouldn't be a big deal, but the frequency is overwhelming. I Can't See: All told, TMNT does have its fun moments. Those few enjoyable moments come in the platforming levels of the game that make up about two-thirds of the entire game. Sometimes when you play one of these levels, everything will be perfectly aligned for fun, (by aligned I mean the camera will actually work for two minutes) and you will have a great time. The rest of the time however, the camera will screw up once again and tend to get you thrown into a bottomless chasm or some other deep falling death. Another disappointing flaw that shames the entire series the horrid combat. You would thing that being a ninja would allow you to use more interesting combat moves instead of "punch punch kick. Kick kick punch. Stab stab kick punch." Combat is uninteresting, bland, and uncreative to say the least. In addition to the combat, the way the combat controls is also disappointing. I can see Ubisoft trying to simplify the controls for the younger audience, but they take it too far. Each turtle has basically only one attack button, with the jump-attack being the "combo"
The worst thing is that while each turtle has a combo, each only has one combo. Also, while the combo is relatively long, you only have that one to look at. 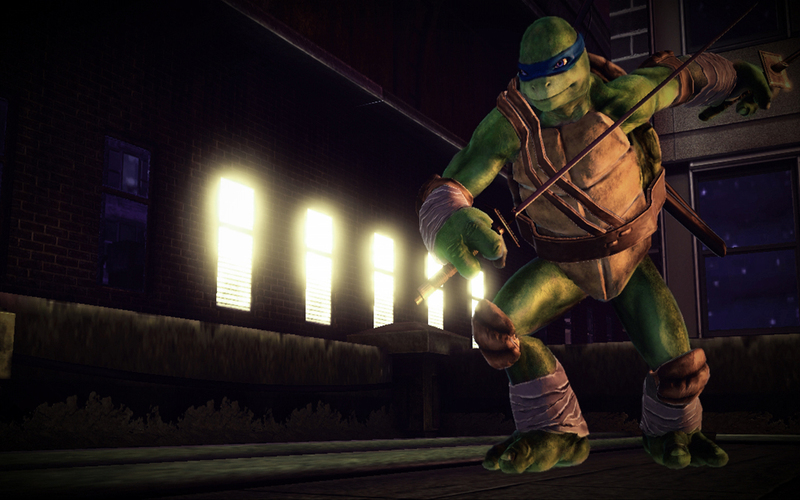 Rent vs. Buy: All in all, TMNT is a mediocre game at best. With the uninspiring combat, the constantly screwy camera, and the repetitive gameplay, TMNT just doesn't do enough to keep itself afloat. Add in the sub-par at best graphics and you have yet another bad movie-to-game. The visuals in the 360 version look the best, but that isn't saying anything. The PS3 and the Wii versions don't look any better then a last-gen game, and don't even ask about the PSP and DS.